P. Gotz discovered asteroid #538 Friederike. The Messerschmitt Me 262 Sturmvogel, the world's first jet bomber, made its first flight with jet engines. NASA and the USAF launched X-15A VO Stability Test mission # 89 in which Robert Rushworth reached a maximum speed of 6317 kph (Mach 5.63) and a maximum altitude of 31.943 km. 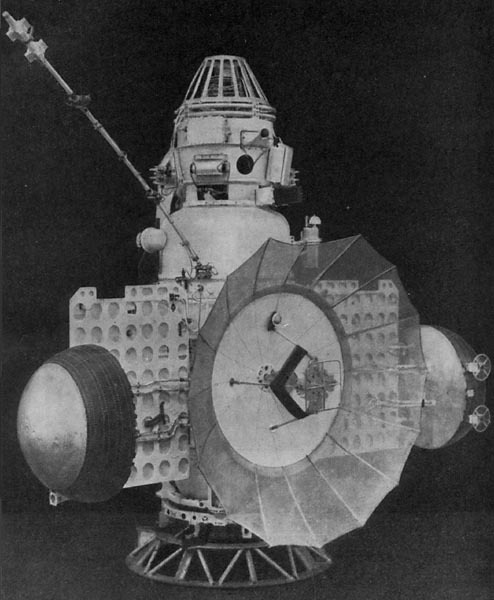 USSR launched the Zond 3 Lunar flyby mission. Zond 3 was launched 18 July 1965 from a Tyazheliy Sputnik Earth orbiting platform towards the Moon and interplanetary space. The spacecraft was equipped with a camera and TV system that provided automatic inflight film processing. On 20 July, Lunar flyby occurred approximately 33 hours after launch at a closest approach of 9200 km. 25 pictures of very good quality were taken of the Lunar far side from distances of 11,570 to 9960 km over a period of 68 minutes. The photos covered 19,000,000 square km of the Lunar surface. The pictures showed clearly the heavily cratered nature of the surface and the mission dramatized the advances in space photography that the USSR had made since its first far side effort six years earlier. Photo transmissions by facsimile were returned to Earth from a distance of 2,200,000 km and were retransmitted from a distance of 31,500,000 km (some signals still being transmitted from the distance of the orbit of Mars), thus proving the ability of the communications system. After the Lunar flyby, Zond 3 continued space exploration in a heliocentric orbit. The spacecraft design was similar to Zond 2. In addition to the imaging equipment, it carried a magnetometer, ultraviolet (0.25-0.35 micron and 0.19-0.27 micron) and infrared (3-4 micron) spectrographs, radiation sensors (gas-discharge and scintillation counters), a radiotelescope and a micrometeoroid instrument. It also had an experimental ion engine. It is believed Zond 3 was initially designed as a companion spacecraft to Zond 2 to be launched to Mars during the 1964 launch window. The opportunity to launch was missed, and the spacecraft was launched on a Mars trajectory, although Mars was no longer attainable, as a spacecraft test. NASA and the USAF launched X-15A Checkout, Systems Test mission # 161 in which William Dana achieved a maximum speed of 5177 kph (Mach 4.71) and a maximum altitude of 29.291 km. It was the first flight with the X-20 energy management system. NASA launched the Gemini 10 Agena Target Vehicle (GATV-10) from Cape Kennedy, Florida, used for rendezvous practice and maneuvers during the Gemini 10 mission. The Gemini 10 Agena Target Vehicle (GATV-10) was successfully launched from Cape Kennedy on 18 July 1966 into a nearly circular 300 km (162x157 nautical mile) orbit. Gemini 10, launched an hour and 40 minutes later, achieved rendezvous with GATV-10 at 10:43 pm EST and docked at 11:13:03 pm EST. A large out-of-plane error in the initial Gemini 10 orbit required use of 60% of its fuel for the rendezvous, over twice the planned amount. To conserve fuel, Gemini 10 remained docked to GATV-10 for the next 39 hours, and used the GATV propulsion system for maneuvers. A 14 second burn of the GATV-10 primary propulsion system was used to raise the dual spacecraft apogee to 764 km. While the spacecraft were docked, a bending mode test was conducted to study spacecraft dynamics. Another burn of GATV-10 at 3:58 pm EST on 19 July brought the spacecraft into a near-circular 380 km orbit, the same orbit as the GATV-8, which had been launched on 16 March for the Gemini 8 mission. Gemini 10 separated from GATV-10 at 2:00 pm EST on 20 July. 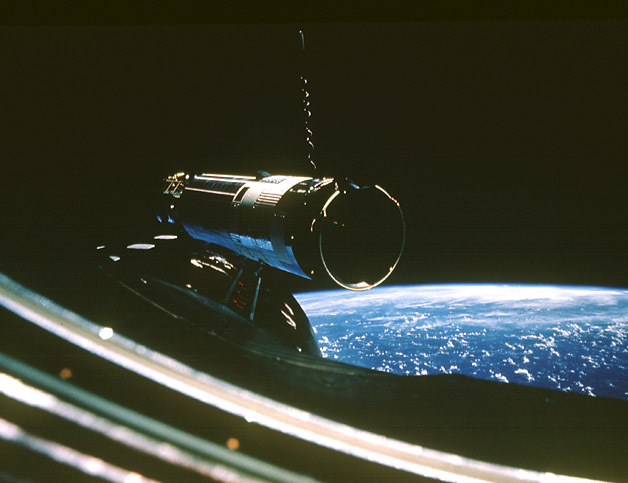 After reentry of Gemini 10, a primary propulsion system firing put GATV-10 into a 386.6 x 1390.8 km orbit to determine temperature effects of such a high orbit on the vehicle (no appreciable differences were found). Another primary system firing, followed by a secondary system firing, resulted in a circular 352 km orbit. In total, the GATV-10 received and executed 1700 commands, 1350 from ground control and 350 from Gemini 10. The Gemini Agena Target Vehicle was designed to be launched into Earth orbit prior to a Gemini mission and used for rendezvous and docking practice. The GATV had a docking cone at the forward end into which the nose of the Gemini spacecraft could be inserted and held with docking latches. The GATV was a 6 meter long cylinder 4.9 meters in diameter. The primary and secondary propulsion systems were at the back end of the target vehicle with the attitude control gas tanks and the main propellant tanks. The docking cone was connected to the front end by shock absorbing dampers. Acquisition running lights and target vehicle status display indicators were situated on the front end. A 2.1 meter long retractable L-band boom antenna extended from the side of the cylinder near the front. Tracking and command of the GATV were also aided by a rendezvous beacon, two spiral L-band antennas, two tracking antennas (C-band and S-band), two VHF telemetry antennas, and a UHF command antenna. Micrometeoroid packages and other experiments could also be mounted on the GATV. NASA launched the Gemini 10 Earth orbiting mission carrying John Young and Michael Collins. Gemini 10 was the eighth manned Gemini Earth orbiting spacecraft, crewed by astronauts John Young and Michael Collins. Its primary purpose was to conduct rendezvous and docking tests with the Gemini Agena Target Vehicle-10 (GATV-10). The mission plan also included a rendezvous with the Gemini 8 Agena target, two extravehicular activity (EVA) excursions, and performing 15 scientific, technological, and medical experiments. The scientific experiments were related to (1) zodiacal light, synoptic terrain, and synoptic weather photography, (2) micrometeorite collections, (3) UV astronomical camera, (4) ion wake measurements, and (5) meteoroid erosion. Gemini 10 was launched 18 July 1966 from Complex 19 and inserted into a 159.9 x 268.9 km (86 x 145 nautical mile) elliptical orbit. At orbit insertion, Gemini 10 was very close to the nominal 1600 km (1000 mile) slant range behind GATV-10, which had been launched into a nearly circular orbit about 100 minutes earlier. Rendezvous with GATV-10 was achieved on the 4th revolution at 10:43 pm EST, and docking was achieved at 11:13:03 pm EST. A large out-of-plane error in the initial orbit required the Gemini to use 60% of its fuel for the rendezvous, over twice the planned amount. As a result, most of the mission plan was revised. To conserve fuel, Gemini 10 remained docked to GATV-10 for the next 39 hours, and used the GATV propulsion system for maneuvers; the planned docking practice runs were cancelled. A 14-second burn of the GATV-10 primary propulsion system was used to raise the dual spacecraft apogee to 764 km. While the spacecraft were docked, a bending mode test was conducted to study spacecraft dynamics, and other experiments were performed. Another burn of GATV-10 at 3:58 pm EST on 19 July brought the spacecraft into the same orbit as GATV-8, which had been launched on 16 March for the Gemini 8 mission. At 4:44 pm EST, the Gemini cabin pressure was reduced to zero, and the hatch was opened. Collins stood up in his seat 3 minutes later and began photographing stellar UV radiation. Partway into the standup EVA, Young and Collins began to experience severe eye irritation from an unidentified source, and Young ordered termination of the EVA. Collins sat down and the hatch was closed at 5:33 pm EST, and a high oxygen flow rate was used to purge the environmental control system. Gemini 10 separated from GATV-10 at 2:00 pm EST on 20 July. A series of manuevers using its own thrusters brought Gemini 10 within about 15 meters of GATV-8. At 6:01 pm EST (48:41 ground elapsed time), the cabin was evacuated and the hatch opened for Collins to begin his second EVA. Collins left the spacecraft 6 minutes later, attached to an umbilical cord, and travelled to the GATV-8. Despite difficulties due to lack of handholds on the target vehicle (Collins lost his grip the first time, and tumbled head over heels at end of the umbilical around Gemini), Collins removed the fairing and retrieved the micrometeoroid detection equipment (on the second try). During the EVA, he also lost his camera, and retrieved the micrometeorite experiment mounted on the Gemini 10 spacecraft, but the latter apparently floated out of the hatch and was lost when Collins reentered the capsule. The EVA was limited to 25 minutes of outside activity due to lack of fuel. Collins reentered the capsule at 6:32 pm EST and the hatch was closed at 6:40. The hatch was reopened again at 7:53 pm EST to jettison 12 items before reentry. After about three hours of station keeping, Gemini 10 moved away from GATV-8. At 8:59 pm EST, the crew performed an anomaly adjust maneuver to minimize reentry dispersions resulting from the retrofire maneuver. Retrorocket ignition took place during the 43rd revolution on 21 July at 3:30:50 pm EST, and splashdown occurred at 4:07:05 pm EST in the western Atlantic at 26.74 N, 71.95 W, 875 km east of Cape Kennedy and 6.3 km from the target point. The crew was picked up by helicopter and taken to the recovery ship USS Guadalcanal at 4:34 pm EST, and the spacecraft was aboard at 5:01 pm. Total mission elapsed time was 70:46:39. Of the primary objectives, only the docking practice was not accomplished due to lack of fuel, although the fuel budget also resulted in small revisions in some of the other objectives. The first rendezvous and docking maneuvers were successfully accomplished. All experiments obtained data except for the Gemini 10 micrometeorite collector, which was lost by floating out of the spacecraft. The landmark contrast measurement experiment was deleted due to lack of fuel. Gemini 10 demonstrated the ability of an astronaut to travel to another spacecraft and back, and the use of powered, fueled satellite to provide propulsion for a docked spacecraft. C. Torres discovered asteroid #2654 Ristenpart; and C. Torres and S. Cofre discovered asteroids #1973 Colocolo, #1974 Caupolican, #1992 Galvarino and #2028 Janequeo. Intel, the firm which produced the world's first microprocessor, was incorporated. Lucien Henri d'Azambuja (28 January 1884 - 18 July 1970) devoted his scientific career to the study of solar activity. His 1949 treatise, co-authored with his wife Marguerite and entitled "Etude d'Ensemble des Protuberances Solaires et de leur Evolution", remains a standard reference on the subject. The first firing of a shuttle Solid Rocket Booster motor, a 2 minute test, took place at the Thiokol facilities in Brigham City, Utah, and developed 2.4 million pounds of thrust. USSR launched the Raduga 4 communications satellite from Baikonur, which was positioned in geosynchronous orbit at 35 deg E in 1978-1981. India became the seventh nation to launch a satellite into orbit on its own rocket with the successful launch from Sriharikota of Rohini 1 on their SLV-3 rocket. USSR launched Molniya 3-13 from Plesetsk to operate the Soviet Union's long range telephone and telegraph radio communication system, and transmit USSR central television programs to stations in the Orbita and participating international networks. USSR launched the Progress 37 unmanned resupply vessel from Baikonur to the Mir space station. Progress 37 was an unmanned resupply vessel launched 18 July 1988 to the Mir space station. It docked with Mir on 20 Jul 1988 22:33:40 GMT. Refuelling operations were performed on 7, 8, and 9 August 1988. Progress 37 undocked from Mir on 12 Aug 1988 08:31:54 GMT, and was destroyed in reentry on 12 Aug 1988 13:45:40 GMT. Total free-flight time: 2.27 days. Total docked time: 22.42 days. USSR launched the Resurs F-3 landsat from Plestesk to investigate the Earth's natural resources, which deployed two passive "Pion" probes for upper atmosphere density investigations on 9 August. USSR launched Cosmos 2085 from Baikonor for relaying telegraph and telephone information, which was positioned in geosynchronous orbit at 80 deg E in 1990-1994. China launched the Sinosat 1 geostationary communications satellite from Xichang on a Chang Zheng 3B booster. Sinosat 1, launched 18 July 1998, and the CZ-3B liquid hydrogen upper stage, were placed in a 609 x 35958 km x 19.0 deg geostationary transfer orbit. The first two liquid apogee burns were carried out on 19 and 21 July. Sinosat, an Alcatel Spacebus 3000, was built in Cannes and owned temporarily by EurasSpace, a joint venture between Daimler-Benz Aerospace and the China Aerospace Corporation. After on-orbit testing, it was delivered to the Sino Satellite Communications Company of Shanghai for communications services in China. The satellite carried 24 C-band transponders and 14 Ku-band transponders which covered the entire Asia-Pacific region. With a design life span of 15 years, the satellite was to provide multiple data transfer services for China's financial and air transportation control systems, as well as the Shanghai Information Port project. Sinosat operated in geosynchronous orbit at 110.5 deg E in 1998-1999. As of 5 September 2001, it was at 110.55 deg E drifting at 0.012 deg W per day. A new space tracking ship, Yuan Wang 4, was delivered to China Satellite Launch and Tracking Control General by the China State Shipbuilding Corporation, converted from the scientific survey ship Xiang Yang Hong 10. During the 6h 29m STS-104-2 EVA, astronauts Gernhardt and Reilly assisted installation of Quest module oxygen and nitrogen tanks from the shuttle pallet using the ISS RMS arm; minor valve configuration and recalcitrant connector problems were overcome. STS 104 was launched 12 July 2001. Main engine cutoff and external tank separation was at 0913 GMT. Atlantis was then in an orbit of 59 x 235 km x 51.6 deg. The OMS-2 burn at 0942 GMT increased velocity by 29 m/s, and raised the orbit to 157 x 235 km x 51.6 deg, and another burn at 1240 GMT raised it further to 232 x 305 km. Atlantis docked with the International Space Station at 0308 GMT on 14 July 2001. Top priority for the mission was installation on the International Space Station of the Quest Airlock, to give station crewmembers the capability of conducting spacewalks from the orbiting laboratory using either Russian or US spacesuits. It consisted of an Equipment Lock for storage, and the Crew Lock, based on the Shuttle airlock. The Equipment Lock was berthed to the Unity module at one of the large-diameter CBM (Common Berthing Mechanism) hatches, and its "survival heaters" were activated. STS-104 then installed the six ton Airlock, consisting of two cylinders four meters diameter with a total length six meters, onto the Unity module. In a series of spacewalks, the astronauts moved the oxygen and nitrogen tanks onto the airlock exterior. The Airlock could be pressurized by the externally mounted high pressure oxygen-nitrogen tanks, and was to be the sole unit through which all future EVAs were to take place. Prior to its installation, all EVA entries and exits had been through a Russian module in ISS, with non-Russians having to wear Russian space suits. Another payload was the "EarthKAM" of middle/high school interest. It was to allow pupils to command picture taking of chosen spots on Earth; they were expected to target 2,000 spots. The shuttle also carried out pulsed exhaust tests during maneuvers to enable better understanding of the formation of HF echoes from the shuttle exhaust. The echoes were obtained by ground based radars in an experiment called SIMPLEX (Shuttle Ionospheric Modification with Pulsed Local EXhaust). Mission Specialists Michael Gernhardt and James Reilly conducted three space walks while Atlantis was docked to the International Space Station, spending a total of 16 hours, 30 minutes outside. During the first space walk, Gernhardt and Reilly assisted in the installation of the airlock. During the second and third excursions, they focused on the external outfitting of the Quest Airlock with four High Pressure Gas Tanks, handrails and other vital equipment. Orbit altitude: 240 nautical miles. Orbit inclination: 51.6 degrees. STS 104 ended when Atlantis landed on Runway 15, Kennedy Space Center, Florida, on 24 July 2001. The landing was the 55th shuttle landing, and the 13th night landing, at KSC. Florida weather cooperated beautifully, with none of the rain showers that caused waveoff of two landing opportunities a day earlier. The flight crew for STS 104 was: Steven W. Lindsey, Commander; Charles O. Hobaugh, Pilot; Michael L. Gernhardt, Mission Specialist 1; Janet L. Kavandi, Mission Specialist 2; James F. Reilly, Mission Specialist 3. An Ariane 5G launched from Kourou carried Canada's Anik F2 communications satellite to orbit, the heaviest single payload lofted into geostationary transfer orbit (GTO) to that date.